Although I do use moisturiser, my preferred skin saviour is oil. And as the barometer has been dropping rapidly recently, I'm finding that my skin needs more – and more. What I especially love about the texture of oil is that it works so well with a bit of DIY facial massage, which I do, morning and night, come what may. The Art Historian (my husband, in case you're wondering), has also been seduced by the wonders of oil. Perfect, he says, for beard softening and conditioning his post-hill walking and wild swimming skin. Having road-tested the following beautifiers during the cold snap (though oils can be used all year round), here's the lowdown. 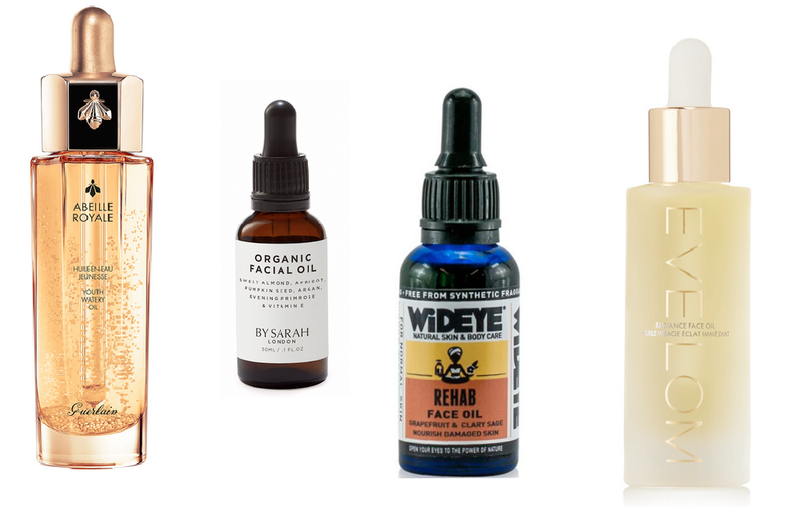 Wideye Rehab Face Oil, £21.95. I've been hooked on Wideye since I discovered their ethical beauty products that pack a punch. With uplifting Grapefruit and Clary Sage, Rehab contains Kiwi Seed and Baobab oils and Sea Buckthorn extract, all of which restore parched and heavily-stressed skin. Verdict: The Art Historian's winner (all Wideye products are suitable for boys and girls|), it's definitely one of my faves too. Smells great, sinks in fast and brings back the glow. Neighbourhood Botanicals The Daily Glow, £28. First up, I love the smell of The Daily Glow. It's somewhere between salad and fresh fruit – that'll be the combination of cucumber seed, orange and grapefruit oils, along with Ylang Ylang, Moringa and Kukui oils. It's light enough to wear as a make-up primer and after a few minutes massage, is easily absorbed. Verdict: An effective 'everyday' oil for all skin types. Organic Facial Oil By Sarah London, £16.50. I've only recently discovered By Sarah, a compact range of organic skincare, created by sisters Sarah and Lauren, that is no-nonsense, honest and upfront about the ingredients used. The Organic Facial Oil is a blend of Sweet Almond, Apricot, pumpkin Seed, Argan, Evening Primrose and Vitamin E oils has very little 'scent', just the natural smell of the oils. This oil feels 'pure' and is intensively moisturising. Verdict: Scoring highly with the Art Historian (great for beards and skin), this oil feels 'pure' and is intensively moisturising. It's also vegan-friendly. Eve Lom Radiance Face Oil, £60. Although my skin has never responded well to Eve Lom's cult cleanser, it has been 'drinking up' this Hemp Seed, Abyssinian and Avocado Oil blend. It's quick to absorb, brilliantly multi-tasking (hair, hands, cuticles love it too) and is light enough to wear under make-up. Verdict: An investment buy. Expensive but worth it. Natural Spa Factory Dusk to Dawn Overnight Repair Oil, £36 (part of the Deep Sleep Gift Set). Being someone who loves my 8 hours, this 'works while you sleep' beauty booster is my kind of skincare. With starflower, rosehip, wheatgerm, sweet almond oil, mandarin peel and neroli oils, it's the perfect massage medium for treating skin that's 'ready for bed'. Verdict: Wake up to fresher-looking, suppler-feeling skin. Juno Day & Night Joie Oil, £60. A new find from Brighton, I love Juno! Created by Julie Johannsen who has travelled the world gathering inspiration for her beautifully simple, capsule skincare rage, Joie Day & Night Oil feels amazing on the skin – and smells heavenly to boot. There are plenty of skin-nurturing goodies in the mix - Kiwi Seed, Rice Bran, Borage, and Pumpkin Seed oils for starters - and deliciously scented Patchouli, Geranium, Frankincense and Rose Oils. Verdict: A luscious skin treat that's worth every penny. Guerlain Abeille Royale Youth Watery Oil, £33.30. Is it an oil? Is it a serum? Is it a lotion? Actually, it's all three-in-one! A cocktail of skin-enhancing blend of honey and Royal Jelly, it contains a suspension of tiny micro-drops of Commiphora (myrrh) oil that 'burst' on contact with the skin. Perfect if you like the idea of an oil but prefer the lightness of a lotion, what I love about Abeille Royale is that it literally 'melts' into skin, absorbs instantly and leaves skin with a bit of a 'sheen'. Verdict: Super-light but luxurious, it's like liquid gold. Sanatio Naturalis Jojoba Oil, £20. All the way from the depths of Peru, this multi-purpose oil can be used as a cleanser – massage in and rinse off with water; a face and body moisturiser and a hair conditioner. What's more, jojoba oil is antibacterial, antifungal, analgesic, and anti-inflammatory, rich in antioxidants and essential fatty acids. Verdict: A brilliant all-rounder that's gentle enough for sensitive skin. Photography by Wendy Carrig at A & R Creative; Styling and Art Direction by Karena Callen at S Management; Model - Caitlyn Leckey at Milk Models; Make-Up by Frances Prescott at S Management; Hair by Sam Hoad.